Coopersburg will receive $300,000 for proposed crosswalk improvements on Main Street at the intersections of West State Street, Carpenter Alley, East Station Avenue and Thomas Street, along with new curbs and streetscape amenities and ADA-accessible sidewalks. They will also be doing improvements to pedestrian lighting on Main Street from Thomas Street to the bridge over a tributary of Saucon Creek north of West State Street and from East Station Avenue to Horse Alley. The total cost of the project is $988,309. The $201,338 grant for Upper Saucon Township will be used by the township to make improvements to the intersection and roadway along PA Route 2045 between the northbound and southbound lanes of PA Route 309. The project includes the removal of the existing concrete median, widening of PA Route 2045 to provide an additional through/left turn lane, shoulders, installing new traffic signal heads, emergency vehicle detectors, pavement markings, pedestrian signals and pushbuttons for crosswalks. The total cost of the project is $398,559. 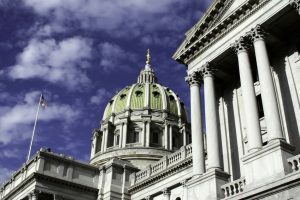 Will Harrisburg Ever Fix the Pension Crisis?